Credit debt and overspending are two of the top reasons people go bankrupt. You are responsible for your future. That future is based on the thoughts, decisions and actions you take every day. While one of the most important things you can do for yourself as an adult is achieve financial independence, you don’t have to go it alone to learn from others’ money mistakes. Find a mentor in your community, talk to adults and family you respect about money and their experiences (the good, bad and ugly). They can shed some light on how they balance wants and needs, put budgeting into practice and live within or below their means. Where did their money go? Click or hover over the cards below to explore what the celebrities have encountered with their finances. Sometimes end up with less than what they started with or even nothing at all. Often get wrapped up in the power and don’t seek sound financial advice. Don’t have good financial knowledge or habits. Overspend and buy things that then cost more money, like giant homes, boats and cars. Used his earnings to invest in technology startups including Skype. Created a name for himself as a venture capitalist with his investment firm, A Grade Investments. Best-known deals include investments in FourSquare, Airbnb and the photo sharing app Path. Grammy Award winner, judge on “The Voice” and entrepreneur of clothing lines. Number 78 on the Forbes world’s highest-paid celebrities list in 2016, he created his wealth mainly from business ventures, such as record producing and his clothing lines. Uses some of his riches to enrich the lives of others: His foundation spent five times more to build an afterschool center than Pharrell spent on his own home. Breakout star of the MTV reality show “The Hills” from 2006 – 2010. By 2011, her money was gone. $100,000 each month spent on hair and makeup. $200,000 in plastic surgeries in one day. $2.5 million for a failed effort to become a recording artist. Uneducated about money; said her ego got too big. Started as a backup dancer and became a force in movies, television and music. Number 68 on the Forbes world’s highest-paid celebrities list in 2016. Filed for Chapter 11 bankruptcy in 2015. Allegedly owes creditors somewhere between $10 million and $50 million. Paid out $7 million for a legal matter. This number affects your ability to buy a car, house, or get a loan, as well as the interest rate you will receive to borrow the money. Factors used to help determine your credit score include your payment history, outstanding debt (aim for balances under 30% of your limit), your credit history, and recent inquiries on your credit score – so apply for new credit in moderation. Also, many companies check your credit score as part of their decision to hire you. If you’re worried about not having enough money to pay for school, you’re not alone. Nearly 60 percent of students feel the same way. * According to the federal Consumer Financial Protection Bureau, about 41 million people are borrowing money for their educations with one in four behind on repayments or in default. The key here is don’t make a large borrowing decision with limited knowledge. Talk to trusted mentors and do your own research to understand the bigger picture of the degree you are obtaining and the salary you expect to earn. Student loans have to be paid back even if you don’t finish your degree, so it’s important to only borrow what is essential to cover costs such as tuition, fees and books. Have a plan to pay back the debt in full and on time (including the extra you’ll pay in interest) since typically six months after you graduate you have to at least start making payments. High interest rate loans and fees can really stack up, as well as those seemingly small bank charges that cover purchases you really couldn’t afford and not having enough funds in your account. 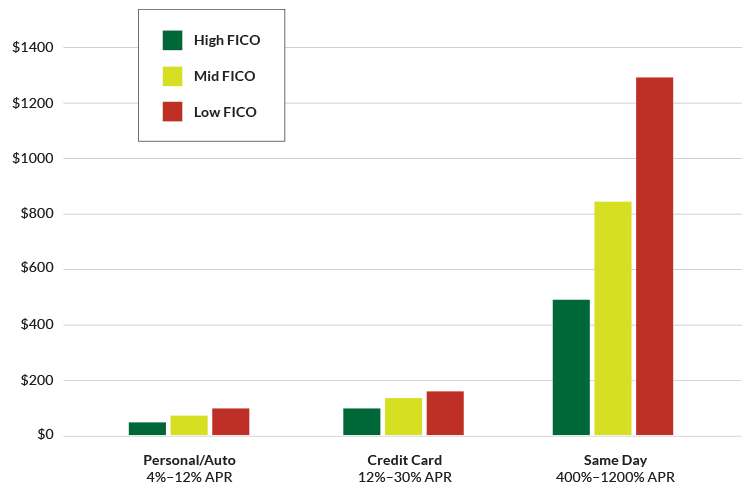 Usually the easiest loans to get are the most expensive, and payday loans fall in that category. Make sure your budget has a spending and saving plan to avoid paying a lot more than you borrowed in the first place. If you’re already in over your head, it may seem impossible to get back on financial track, but solutions are available. Sometimes, it’s possible to turn things around in weeks or months by paying attention to your statements, asking questions, negotiating balances owed and practicing discipline with a reasonable payoff plan. The big idea here is that credit and debit cards should be used carefully. Just because you’re approved for a credit card, doesn’t mean it’s a fiscally smart decision. Different cards charge different rates and fees for allowing you to borrow their money, and when you carry a balance you end up paying a lot more for what you charged than if you used cash. If you do have a credit card and use it responsibly by paying on time and paying off your balance every month, you can build your credit score. Also, it’s important to review your credit card statements and bank accounts regularly – a lot of companies have apps that make it easy to do with a few clicks. Most importantly, don’t spend more than you have. A budget can help make sure you know what your numbers look like. *2015 National Student Financial Wellness Study by The Ohio State University, which surveyed 18,795 undergraduate students at 52 colleges and universities across the country. When companies lend you money, they charge you interest and fees on the money they are loaning you. But, how much they charge and for how long are key numbers to pay attention to. So, how much would you pay back on a $100 loan?